It has been said that these colorful and noisy machines were introduced at casinos to keep the wives and girlfriends entertained while the men spent more time gambling. They probably couldn't anticipate that years later slot machines would account for about 70% of all casino revenue making them the most popular casino game played by both men and women alike. The attraction of instant jackpots and ease of play are just some of the reasons people are drawn toward slot machines. Also, unlike other casino games, slot machines do not require any rules or complicated strategies to memorize. These are some of the most popular slot machines available on the internet today. You can play with them at all of the casinos listed on this site. The object of 5 Dragons is to obtain a winning symbol combination by spinning the reels. The better your symbol combination, the bigger the payout. Select the lines you want to bet on by clicking on the arrowheads left of the reels. To unselect a line, click the arrowhead again. Click 5 Lines to select all five paylines. Choose the value of the coins you wish to wager each round, by clicking the + and – buttons on the left. Click Bet or Max Bet to select the number of coins you wish to wager. Each click on the Bet button increases your bet by the value of the coin you selected. Pressing Max Bet will increase your bet to the maximum amount possible – that is four coins – and spin the reels automatically. Remember that the total bet (that is, the sum extracted from your credit) is line bet x number of lines selected. Click Spin (if you did not press Bet Max), or the arm to spin the reels. If the reels show a winning combination after they stop (along a payline you bet on), you win according to the winning table (see the top panel of the machine). If you win on multiple paylines simultaneously, your winnings are added up. The tables show a certain number for every hit amount for every symbol. If you have four symbols in a row starting on the leftmost reel (that is four hits), read the number on the line “XXXX” and in the column under that symbol. Multiply your line bet by that number and you get the winning amount. If you have winning combinations on multiple lines, add them all up to get the winning amount. The symbols have to lie consecutively, starting from the leftmost reel, to qualify as hits. The winding road is a wild symbol and the police car a scatter symbol. This is a five reel, nine payline slot machine. The object of Goblin's Cave is to obtain a winning symbol combination by spinning the reels. The better your symbol combination, the bigger the payout. · Choose the value of the coins you wish to wager each round, by clicking on the + and – buttons on the left. · Click Bet One or Max Bet to select the number of coins you wish to wager. Each click on the Bet One button wagers one more coin. Pressing Max Bet increases your bet amount to the maximum amount possible – that is five coins – and spins the reels automatically. Remember that your total bet is three times the bet on one row. You can see your remaining credit, the bet amounts and win amount on the machine left of the reels. The tables show a winning amount for every symbol combination that deserves a win. This amount corresponds to $1 line bet. If you are playing with a lower or higher line bet, your winning amount will be different respectively. Multiply your line bet by that number and you get the winning amount. If you have winning combinations on multiple lines, add them all up to get the winning amount. The red diamond with the word “Wild” written on it, is a wild symbol – meaning it stands for any other symbol, like a joker in card games. Goblin's Cave contains a Bonus Game. To access the bonus game, you have to collect three lantern symbols on one row. If you get three lanterns on the first row and another three on the second, you get to play two bonus rounds, and the same goes for three. In the bonus game, choose one of the six chests by clicking on it. It contains a prize for you. 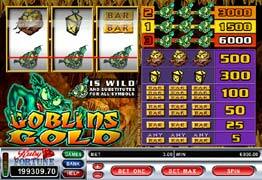 The object of Golden Tour is to obtain a winning symbol combination by spinning the reels. The better your symbol combination, the bigger the payout. · Choose the value of the coins you wish to wager each round, by clicking on the + and – buttons on the right. · Select the number of lines you want to bet on by clicking on the Bet One button or the line number left of the reels. When you click on line number 3 for example, you also select lines 1 and 2. Each click on the Bet One buttons selects one more line. Click Bet Max or line number 5 to select all paylines. Remember, that you bet one coin per each line you select. Clicking Bet Max will also spin the reels automatically. · If the reels show a winning combination after they stop (along a payline you bet on), you win according to the winning table. Click the Paytable button to see the paytable, if you wish. Close the paytable by clicking the Paytable button again. If you win on multiple paylines simultaneously, your winnings are added up. The tables show a certain number for every hit amount for every symbol. For example, if you have four symbols in a row starting on the leftmost or rightmost reel (that is four hits), read the number on the line “XXXX” and in the column under that symbol. Multiply your line bet by that number and you get the winning amount. If you have winning combinations on multiple lines, add them all up to get the winning amount. The symbols have to lie consecutively, starting from the leftmost or rightmost reel, to qualify as hits. If you have five symbols in a row, you are only paid once. The gopher, duck and catfish symbols are scatter symbols – when you get 3 or more of these symbols (of the same kind) on the screen during one round, lying consecutively, you enter the bonus round. The symbols don't have to follow any payline, meaning they can be on any position on the reel. In the bonus game, choose a driver, an iron and then a putter. You will win a prize based on these three clubs you choose. If you entered the bonus game with four scatter symbols and not just three, your prize is tripled. If you entered with five scatter symbols, your prize is multiplied by ten. 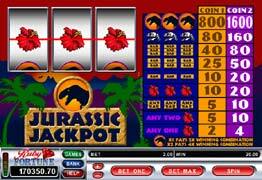 Jurassic Jackpot is a two coin slot machine with a single payline and a Wild Jackpot symbol. Maximum payout is 1,600 coins. The object of Rock'n'Roller is to obtain a winning symbol combination on a payline by spinning the reels. The better your symbol combination, the bigger the payout. · Click Bet One or Bet Max to select the number of coins you wish to wager. Each click on the Bet One button wagers one more coin. And every coin you wager activates one payline, meaning that symbol combinations along that line will count. Pressing Bet Max increases your bet amount and number of paylines to the maximum amount possible – that is five coins and five paylines – and spins the reels automatically. 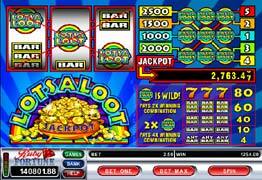 LotsaLoot is a five coin, five payline and three reel slot machine. The LotsaLoot symbol is wild and doubles the payout of any combination it completes. Jackpot can only be won on the fifth payline. The object of Alchemist's Lab games is to obtain a winning symbol combination by spinning the reels. The better your symbol combination, the bigger the payout. · Click Bet One, Bet Two or Bet Max (=three) to select the number of $1 coins you wish to wager. The reels start to spin. Bonus Slot Machines contain a bonus game. To access the bonus game, you must obtain three book symbols. In the bonus game, click three bottles on the screen. You will then win an amount depending on your selection of bottles. 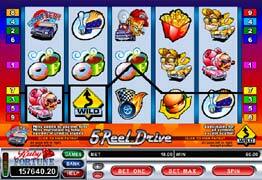 Cool Buck is a five coin, five payline and three reel slot machine with a wild symbol. The dollar symbol is wild, meaning that it can substitute for any symbol. The object of Crazy 7 is to obtain a winning symbol combination by spinning the reels. The better your symbol combination, the bigger the payout (see the winnings table on the machine). · Click Bet One or Bet Max to select the number of coins you wish to wager. Each click on the Bet One button increases your bet by one coin. Pressing Bet Max will increase your bet to the maximum amount possible – that is three coins – and spin the reels automatically. 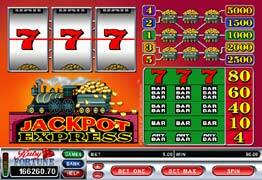 Jackpot Express is a five coin, five payline and three reel slot machine with a wild symbol. The Gold Truck symbol is wild, meaning that it can act like a Joker in a deck of cards and substitute for any symbol.